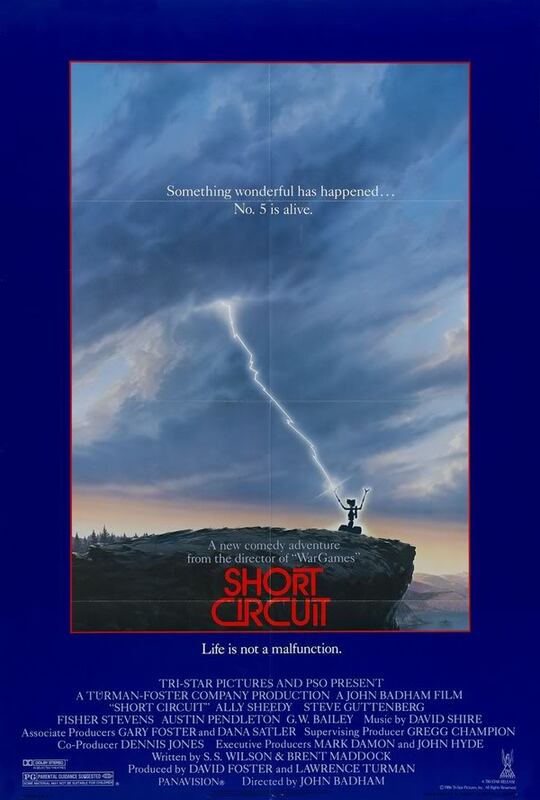 Short Circuit. Turman-Foster Company 1986. I’m a bit surprised at the fact that I only heard of this movie in the last decade. An eighties comedy sci-fi(ish) adventure about a cute robot coming to life seems like the sort of thing I would have been watching once a week as a child. In fact, I only became aware of its existence and cult status after meeting the internet hivemind that loves this movie. Now that I’m actually going to watch it, all I can think of is that lightning doing magical things to machines seems dated even for the 80s. During the gala following Nova Robotics’ S.A.I.N.T. tactical robot demonstration for the military, SAINT Number Five gets hit with a surge of electricity from a lightning strike on the power lines it’s charging from, but doesn’t appear to have sustained any damage. Returning to Disarming, Number Five acts disoriented, gets distracted, and ends up outside the facility, processing strange new inputs. Five’s wanderings lead to Stephanie, who mistakes Five for an alien, and lets him read all her books and watch her TV so he can learn about Earth. When Five learns that living things that get “disassembled” die and cannot be reassembled, he develops an intense fear of the disassembly waiting for him at Nova, asserting that “Number Five is alive!” Not only is the scientist that designed Five looking for him, but Nova’s militarized security team has orders to neutralize the potential threat of the malfunctioning armed robot by any means necessary. The best performer in this movie isn’t an actor. The animatronics and puppetry involved in bringing Number Five to life are the real star. Some of the associated effects, like fast reading and flipping a coin, are a bit obviously cheated, but Five’s emoting and interaction are as convincing as can be done with a robot designed to not look like it was designed to be a sympathetic movie character. I’m pretty sure Wall-E took a sizeable amount of inspiration from Number Five (an observation everybody else made in 2007), but it’s easier to get it right in animation than with a live robot puppet. This doesn’t really explore AI rights and ethics issues as much as I was expecting, or even as much as it seems to think. The really messy questions like “what is life?”, and “where does life come from?” get brushed under the carpet. Number Five got struck by magic lightning, and is now alive. Could he be safely studied and reproduced? There’s no discussion of this (though it’s likely, since he rewires himself and lets Newton look at his work). Of course, it would be wrong to dismantle and reset Five without consideration for his will, but instead of actually asking those questions, we get endearingly curious robot antics and a trigger-happy security team playing evil army. I felt some aspects of the plot were a little too worn-out. Stephanie is a good person because she cares for animals… way too much. Newton is a good person because he’d rather play with his robots than shake hands with military people. The boss is a weasel who lets Skroeder’s security force take charge with excessive relish. However, all of those over-familiar devices serve as a shorthand so we get more of Number Five. I would have liked more exploration of the other characters, but Five was their best and no doubt most expensive asset, as well as the central character, so it makes sense to give him more time. The heart and soul of the movie is Five’s heart and soul.